Maura graduated from Northeastern University with her Doctorate of Physical Therapy. While in school Maura spent time working in multiple settings including outpatient orthopedics, inpatient surgical/general medicine, and outpatient pediatrics. 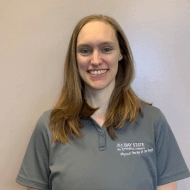 Maura has a special interest in treating patients of all ages with orthopedic conditions with a focus on manual therapy, therapeutic exercise, and patient education. Maura grew up in West Roxbury and participated in numerous sports, but most loved playing competitive volleyball for 8 years, which including a 2 week tour in Brazil. In her free time Maura enjoys spending time with her family and friends, and traveling.